This has started out to be a really lovely weekend. My stepson’s mom decided to stay in Tahoe on Friday night with my stepson, because it was HOT HOT HOT on Friday in the Sacramento area. Literally by far the hottest day in a string of 100+ degree days. SS was having such a great time in the mountains, and my husband was just getting back from a work trip in Vegas all week, so we let them stay an extra day. I was bummed not to see SS but my husband was super tired from his trip and we had a date night! It was literally the first time in forever we have gone to dinner together. Actually if feels like we have had really no time together with just the two of us most of the summer. It was actually so great to just chat, especially since he was gone all week. This morning I went to the gym, for the fourth time this week. Usually I am lucky to make it twice, and I try to work out at home twice. SS wasn’t getting home until late morning and my husband was doing some kind of fantasy football draft. Class is at 9, which is the perfect time for me. If felt so great to start my day with a hard workout. When SS was dropped off he was clearly overtired and cranky so we just went to lunch, hit the grocery store, and came home to relax. I even got a nap! When I woke up i started dinner and then had a ton of energy so I decided to work on one of my home projects, which I never seem to have time to complete. The one good thing about my husband being gone all week…..all of my normal weekend chores I had done before he got home! So I actually had time! Woooohoooo. So I didn’t think to take a before picture, but to give you a vision, this food storage area in our nook was a disaster. Completely unorganized and the shelves above with the Thomas Keller Cook books were not there, nor was the chalk board heart. 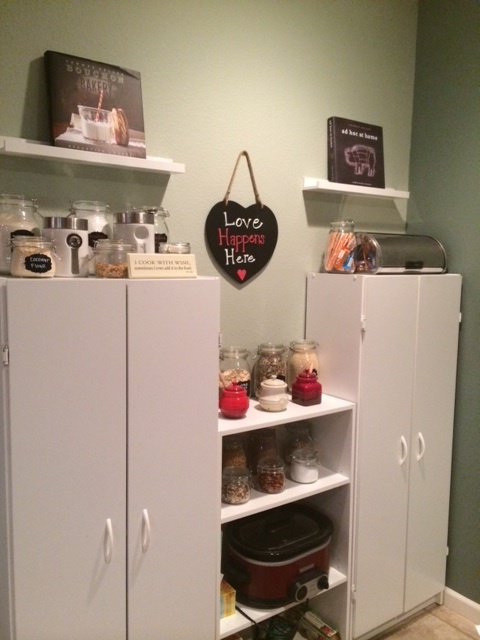 I scored the chalkboard heart at world market for like $8 last weekend, and the shelves I found at Ikea for $10 each. 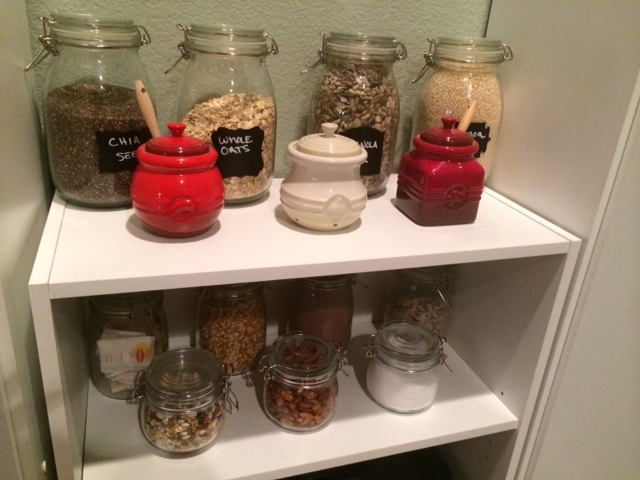 I also added the chalkboard labels to my bulk jars (also a World Market purchase for $3 I think). I was tired of having to open the jar and try to figure out what was in it, especially the ones with different types of flour. 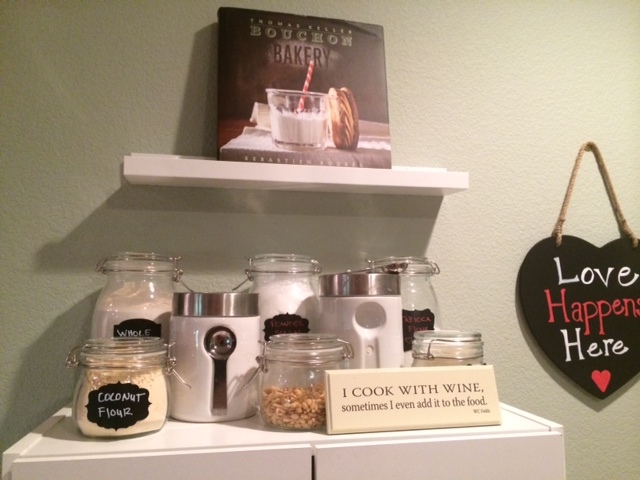 I thought it would be nice to display these very nice cookbooks in the kitchen. If you are not a foodie, Thomas Keller is known as one of the best chef’s in the world. I am super lucky to live close enough to Napa where he has four restaurants, to have experienced some of the amazingness. It is still on my bucket list to eat at the French Laundry. Bouchon Bakery is a MUST stop on all of our Napa days. My mouth waters just thinking about it!! –Random side story…..A few years ago I was flying home from Kansas and had a layover in San Diego. On my final flight the person next to me started chatting with me. I don’t generally chat on planes but he was super interesting and he mentioned he was a chef and I am really into gourmet food. He had so many interesting stories about his career I was totally fascinated. As the conversation progressed he mentioned that he owned a bunch of restaurants in Napa with his brother. As it turns out, he was Joseph Keller, Thomas Keller’s brother. I googled him after I got off the plane, and it was totally him! I could have talked to him for hours! Anyway…..Sorry about the crappy Iphone pictures, but I really wanted to document that I actually finished a project. I hope you all are having a great weekend! Lol. Actually I think I saw you at an event in sac in May but I could not think of a way to say hello without being incredibly awkward. What a great idea! Looks so cute! And what is up with this weather?! ?